Outdoors it does produce flowers, but these are almost never seen on a plant grown indoors.The Selloum grows best in bright filtered light. It does not tolerate dryness, so keep it evenly moist at all times. Its large leaves are quite delicate and therefore prefer a humid location whenever possible. Regular pruning is needed to keep the plant a manageable size. As it grows taller, the weight of the leaves usually pull the main stem over. It can take on some very unusual forms when this happens, often growing horizontally along the floor. 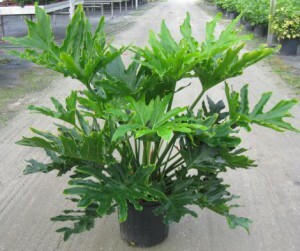 The Philodendron Selloum is quite resistant to disease and pests. It is prone to spider mites if the air is too dry. Although rare, the thrip pest may infest this plant and can severely damage the leaves. Regular inspection and cleaning of the leaves with a damp cloth will prevent most insect issues. Regular fertilizing is important too; this will keep the leaves from becoming pale and yellow.